Manufacturer & Supplier of Lightning Electrode & Lightning Conductor. The main function of the lightning protection system installed on the existing building is to capture a lightning strike and then conduct discharge current safety to the ground. The building requires number of copper rods, number of down conductors, number of earth pits, maintenance of all this put together becomes a costly & wastage of time also. · In some conditions, however the active lightning system is the only possible method to protect from direct lightning strikes.Basis this, we recommend to use the active lightning protection whenever the conventional solution is inconvenient or when the former is more preferable to the latter as in the case of the efficient protection of architect. · Early streamer emitting air terminals are designed to emit a streamer early in the streamer-formation phase of a lightning strike, thereby becoming the preferred lightning attachment point. As the ground charge builds immediately before the lightning strike, the ESE air terminal accumulates ground charge. In the instant before the strike, when the stepped leaders are branching down from the cloud, the ESE terminal emits a series of pulses of ground charge, forming a streamer from itself before streamers emit from other structures. Its streamer reaches the stepped leaders before competing streamers, thereby winning the competition. 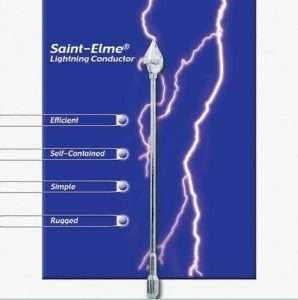 Ground charge accumulation and streamer triggering is done by FRANKLIN FRANCE Saint-Elmo ESE lightning conductor. With piezoelectric exciter device Complies wih NFC 17-102 standard Franklin – France / CEA patent Franklin France presents you the Saint-Elme ® lightning conductor. It results from the research work conducted with the French Atomic Energy Commission, and is the efficient, inexpensive and clean protection solution, using piezo – electric ceramics to transform the wind energy into electric energy. A rod – type lightning conductor, connected to earth, efficiently works by altering, at its level, the equipotentials which match the structures of the building it protects. The emergence of the lightning conductor is an important factor in increasing the local electric field. The principle of the piezoelectric lightning conductor designed by Franklin France relies on several factors : the reinforcement of the local electric field and the early creation of a preferential discharge channel. Capture Head Profiled, inalterable and good conductor, structured to generate a forced air circulation at its tip and in its prolongation (VENTURI system : air intakes and peripheral ejectors). Support Pole Of treated copper (or stainless steel according to models) which upper part has one or more stainless steel ion emitter points, inserted in an insulating sleeve and subjected to the potential supplied by the piezo-electric ceramic. The emitter points are protected from direct impact by lightning and from the weather by the capture head which, like the support pole, is permanently connected to the earth potential.